they said don't even try. some said I'd even die. Didn't I tell you that I would come through it ? Do you remember how I said I'd do it ? and said I had no guts or genitalia. The Wacky World of Wills & Burke theme tune, sung by Garry McDonald of Norman Gunston and Mother & Son, written by Red Symonds of the band Skyhooks and the TV show Hey Hey It's Saturday. Macadam; So thats it then, you've been through the whole lot, there's no one left ? Assistant; Dashing, charismatic expedition leaders don't grow on trees. Macadam; What's wrong with Tony ? Assistant; He was worried about his skin drying out in the desert. Burke [pointing to map]; Surely it can't be that complicated, look, why don't we just follow this road here? Wills; That's a contour line. This movie cost $AUD 1.7 million to produce and was released in the same year as the $AUD 10 million Hoyt's Edgely blockbuster production, Burke and Wills. It was filmed entirely in Victoria, with the desert scenes being shot in a Weribee quarry. The movie starred an 18 year-old Nicole Kidman in her seventh film (BMX Bandits in 1983 was her third). It was released as Wills & Burke and then retitled The Wacky World of Wills & Burke for Australian audiences and Wills & Burke: The Untold Story for US audiences. Wills & Burke not only had its humour to commend it, but revealed a much surer understanding of the Expedition than its much more pretentious rival [Burke & Wills]. Because its makers realised that the Expedition had been one of colonial Melbourne's great entertainments, they presented it as a burlesque which the Exploration Committee had deliberately set about creating. 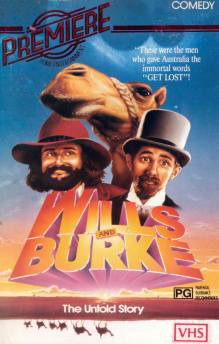 This Australian lampoon of historical epics stars Kim Gyngell as William John Wills and Garry McDonald as Robert O'Hara Burke, two real-life Australian explorers. Setting out to travel across the Australian continent and back again, Wills and Burke both perish on the return trip. In rehashing this oft-told story, director Bob Weis and screenwriter Philip Dalkin decided to play for laughs. Evidently many domestic viewers missed the point, inasmuch as Weis was compelled to tack the words The Wacky World Of... onto his title. Still, the film was greeted with stony silence by non-Australian audiences, who neither knew nor cared who Wills and Burke were. The trailer at some film in about '85-86 led me to watching this,and I hate to say this this but the trailer was much better than the film. It takes you along the final weeks of William Wills & Robert Burke and the crossing of outback Australia that was never completed by Europeans before. I got very confused and was lost after about 30 minutes, but Gary Mcdonald is one of my favorite Australian comedians and with the help of Kym Gyngell it keeps the film just going. Cashing in on the release of Burke and Wills, this undistinguished comedy by Bob Weiss tries to turn the tragic crossing of Australia's desert in 1860 into fodder for humor, but it is tasteless fodder in the end. Robert O'Hara Burke (Gary McDonald) and William John Wills (Kim Gyngell) set out from Melbourne with a large caravan of supplies and people, intending to reach the northern coast and the Gulf of Carpentaria. Out of the 19 men who started the trek, only one returned alive. There are a few good performances delineating minor characters in this ostensibly dark comedy. One notable feature of the film is that a young Nicole Kidman plays Julia Matthews, a Melbourne singer who had a long affair with Burke.